In May 2010, the U.S. Army published a 69-page study evaluating the CrossFit program and its effects on combat fitness. This document summarizes the findings of a comprehensive evaluation of 14 military athletes over an eight-week period. Currently there exists a host of anecdotal evidence claiming that the CrossFit program is effective. However, to date, only one formal study within the U.S. Army has attempted to add empirical evidence to these claims. 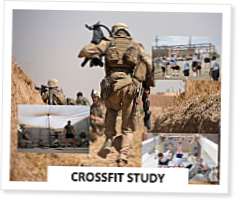 Our study seeks to contribute to the discussion by adding further analytical research on the CrossFit program in hopes of helping U.S. Army leaders make well-informed decisions regarding the future of U.S. Army physical-fitness training. Interesting, but it is a crying shame the sample size wasn't larger nor did they utilize a control group. I have no doubt that CF is a better way to prepare soldiers, but given the resources at their disposal, it is too bad they did not prepare a more comprehensive study. I couldn't agree more with Thomas, however anyone else looking to do a similar study now has a platform to go from and can learn from the mistakes made by others. It's great to see someone taking this approach since CrossFit is evidence and science based. In fact, that authors of the study do note the flaws of a small sample size and lack of control group and suggest a larger follow up study. Hopefully that materializes sometime soon! Excellent pilot. Who has the capabilities to conduct a grander study and would like to fund a summer post-doc? In all seriousness, an outstanding platform to spur further validation in a community of trained skeptics (research scientist). The major problem I have (in addition to the one's already mentioned) is that this study basically measured the ability of Crossfit to improve performance in Crossfit. If they had them do Nautilus circuits we would expect them to improve on a Nautilus circuit test. The link between CF and job performance is not established. The missing piece here is a functional Army fitness test similar to the one used in the 40's as mentioned in the study. The problem with that study is that it was pass/fail so you can't really measure improvement. I don't think developing such a test is tall order either since you only have to do the same test at the beginning and at the end and measure the improvement. Anything reasonable would work, and it doesn't have to be standardized - just difficult. You could manipulate heavy equipment, do a ruck march, sprint in MOPP gear, run an obstacle course (Ft. Benning has a nice one) etc. Then you can measure if Crossfit improved functional fitness without needed to train in the specific tasks. Lastly, as a former officer, the performance of some of these participants is a little embarrassing. No question that the current APFT program gets a huge UNSAT. Regardless of what the "BIG Army" says, units across the Army have been using CrossFit for the past fews years. I have been using CrossFit exclusively in my platoon for the last 4 years. The biggest issue I have is that every Soldier doesn't want to push themselves past their individual comfort level. Regardless of how much yelling or coaching you do some of them are lazy. The Soldiers who are motiviated and want to improve do. The same goes for traditional Army PT also. Heh, MAJ Paine (first named author/contributor) did this on purpose. What a riot. Enjoyed the article and I think it yielded positive steps for the soldiers involved. I have been a recruiter for 11 years and have not been in the "operational" Army since 1998. I'm sure alot of these things were considered by the authors, but I'm just sharing thoughts rather than 2nd guessing. An advantage of Crossfit is its adaptibility. The programming of this study could have shown what a steady program of Tabata, Death by (increasing by 1 each min) and 400M and 800M intervals for running could have done for the APFT score over a 30, 60 and 90 day period. Using the above training methods to enhance job performance (as measured by the APFT), could change attitudes toward the way small unit PT is performed. A future study could show the ineffectiveness of the LSD run by training a platoon for 30 days in runs no longer than 800M. Interval training for a full month and then re-test the 2 mile time. Equipment and space is a huge consideration for "big Army." The programing can use the terrain and equipment already in place. Pull up bars, rope climbs, hills, HSPU. I can't picture rings, Olympic weights and GHD machines out in the open on post. Squad on squad competition could be an interesting study. People will push themselves if there is competition involved where they might not as an individual. "Men will die for points" should be a familiar quote. I'm picturing the format for the Crossfit Games affiliate competition. Platoon, Company, BN, BDE are the levels that the squads would have to compete in. Measure APFT scores before and after to find out if the level of competition carries over to the APFT. This is a commendable step in the right direction instead of assuming CrossFit is too "black boxey" as to even be studied scientifically, or the "shut up stupid, don't question it, just look at the results!" approach which is my impression of how many people consider(ed) it. The authors of this work can be commended for the idea and for the detailed tracking of progress using work calculations. "Both a larger sample size and the addition of a control group would generate more data and a greater understanding of the impacts of a functional fitness program." They would generate *better*, higher quality data, not just more data. "First, recognizing that some athletes’ level of fitness at the beginning of the study was minimal, we acknowledge that any fitness program would likely achieve some increases in work capacity and fitness. Many of the athletes prior to the study were not working out four or five days a week. Therefore, simply conducting more physical training regardless of its quality would have produced positive gains in work capacity." Person 14 gaining 100lbs on their deadlift. "It is our assessment that the reason the increases in push-up and sit-ups were not as great as the other WODs is because all of the athletes in the study had significant experience doing push-ups and sit-ups as opposed to many of the other movements introduced in the study. This is because all of the athletes in the study were military officers who have been required to pass a physical fitness test throughout their career that included these two exercises. Therefore, these athletes had less potential for significant improvement in a short period of time in the APFT than in the other WODs." "We cannot over-emphasize the important role that we believe effective coaching played in the results the athletes achieved in this study." So is the article saying CrossFit is the cause of results, or coaching? One cannot tell. 5) are the percents from the 3 lines in Figure 1 supposed to add to 100%? 6) I'd think that readers will not be convinced that the Army or military in general is adopting or should adopt CrossFit from this article, despite the 'official' look of the paper to those outside the military. It looks like a handful of people in the military are doing CrossFit, which is different. 7) not a random sample, but highly selected volunteers. One cannot infer results to larger population. 8) techniques used are not "specific CrossFit movements" in my opinion. Many programs use deadlifts, squats, pullups, runs, etc., in various combinations. That is, do a similar study but take out the name CrossFit, the named workouts, change the specific order of exercises, etc. I'm not sure what adding a brand to the study adds to the science. Especially the decreases in APFT pushups and APFT situps, since the participants have hopes of improving the APFT presumably. "But sir, while my APFT decreased my average power output in Fran increased!" probably won't cut it to their superiors. Also, by looking at average power, the individual decreases in power are "hidden in plain sight". 11) the "metabolic pathways" and "ten general physical skills" models included seems forced to me. Why not just talk about pre and post performance in the workouts? 12) "The second consideration was the desire to allow for adequate recovery for athletes during the week, especially in the first two weeks of the program. For this reason, the training plan specifically sought to avoid the same type of movements multiple days in a row. This allowed athletes who had not been working out regularly before the study to maintain the intensity of their workouts throughout a week." seems to violate "constantly varied if not random". You'd expect to get some of the same movements or even identical workouts back to back if it was constantly varied and especially if random. 13) I'm not convinced that increases in power is all there is to fitness. For example, if you do more sloppy reps to me that is not as good as solid but less reps. Same with time, if you finish faster but your work is less quality. If you do more reps with lighter weight and get more power than another who does less reps with a heaver weight. Some things are just difficult to compare. 14) re: combining data for male and female into a single mean, the means should probably be computed separately for each gender. Again, GOOD work overall, to be commended and improved for the future. guy is a PE instructor at west point, and this was by no means a scientific experiment as it describes the results of just two guys, but its very interesting nontheless. gist of it is the guy loves powerlifting and in four months did very little running, increased his back squat from 365 lbs to 515 lbs, deadlift from 405 lbs to 490lbs, bench press from 250 lbs to 300 lbs. Then took just one month to train for the APFT with interval running and tabata pushups and situps and performed rather well. for those in the army it really speaks to how the army is terribly out of date with how it evaluates fitness (both in regards to the APFT and body fat tape testing). This study is meaningless without a control group. Specifically, all it can claim is that people practicing Crossfit will get better at Crossfit. That is not a very interesting result. Also, throwing out the data for the 2 mile run is inexcusable. The weather can be noted, but the data should be presented. Not presenting the data is borderline dishonest and at the least insulting the intelligence of those reading the study. I agree with the previous comments on why this study fails - but lets throw in 6 weeks. The novice effect would be very much present here in all who participated. The study would have to be done not only with more people, but over a longer period of time with results posted. Justin makes a lot of interesting points. I'm impressed that a group of Army officers are taking a leadership role with respect to analyzing the Army's physical fitness program. This thesis is another piece of evidence indicating that white washing a manual and allowing soldiers to do PT in uniform does not equate to soldiers who are better physically prepared for the rigors of combat. 1. Coach Glassman and others have stated that Crossfit better prepares you for the unknowable and potentially decreases performance in specific activities. It is no surprise to me that some of the participants saw decreases in performance in certain areas. An interesting analysis is to look at where participants improved. These increases validate the overall increase in work capacity and can be seen as a leveling of a subjects physical fitness. My guess is that their level of "general physical preparedness" as measured broadly by the 10 categories increased versus decreased during this study. Having them perform a work related test before and after the training would more definitively indicate this, I agree. 2. While sample sizes of N=20 are great for creating a normal distribution, 14 is pretty good. Commanders aren't going to allow you to take one of their companies away to do an experiment like this. I'm surprised these officers were able to get this many participants willing to take the time to conduct this study. Sometimes you have to use small sample sizes and extrapolate which is what I believe they have attempted to do. Good for them. 3. I believe that coaching is a contributing factor but without a functional fitness model (in this case the CF model) I believe no appreciable gains in general physical preparedness would have occurred. The point clearly being made with this research is that the current Army Physical Readiness Training program does not prepare soldiers for combat. I believe any functionally based program is better that what we are currently subscribed to. 4. As to sloppy reps and scaling, again, I agree with Coach Glassman. I'm one of the guys without a coach or a box. I know my technique is not perfect but I keep working at it. Greg has made the point that even sloppy execution of the mechanics of CF is better than not doing it at all. Gains in all of the 10 general physical fitness factors can be witnessed even if execution is not perfect. I've witnessed them. I have also experimented with scaling versus Rx. Just because I can lift the weight does not mean I should and on many a WOD I've had a much better WO because of scaling and have later found that my strength or endurance has increased when I believed it would have declined due to scaling. 4. I agree that the chances the Army will accept CF entirely is probably slim. I do believe research like this is causing Senior Leadership to re-examine it's stance on physical training and that's what's important. Changing MWR culture and Senior Leader risk avoidance will pave the way for chalk to be used in the gym and bumper plates to be dropped. I'm looking forward to a day when every fitness center on every installation is set up as a functional fitness center and I no longer have to purchase and my move my own CrossFit equipment. PT should be about combat readiness and not a PT test. I'm happy to see we are getting closer to that reality. my opinion I would rather have someone with me in Combat that can lift, push, pull, run, squat, run, jump and all around better person/ athlethe/ Soldier next to me than some one that can score a 300 in a PT test but cannot get me out of my vehicle if I am hurt. Am I making any sence? I'm having some problems downloading this article in it's entirety. I will say this however. I have been doing Crossfit WOD's for almost three months now & it has made my day to day life in Afghanistan alot easier than it was prior to me doing this. I haven't taken a APFT since I began the program, but I feel as though I will improve scores across the board. The APFT program is outdated and in need of overhaul & hopefully more NCO's, Officers & Commanders will see the physical & mental benefits to programs of this nature. The Army has a draft manual called "Physical Readiness Training" already circulating amongst Master Fitness Trainers and WLC cadre. I've read through it, and it's not a big departure from the old manual. I'd like to see this draft compared to Crossfit and Military Athlete. This study is a much better conducted one; which actually involves a control group and, relatively, random selection instead of the authors/researchers just "trying to obtain a good mix." They also include run times. There's no doubt that CrossFit works, and, for the amount of time the wods takes, is un-rivaled in a gains/time ratio. The problem, coming from the medical community in the Army, is the concern with safety. As a Lvl I trainer I understand that when done correctly, Olympic lifting and multi-joint movements are very safe. However, I would be willing to bet that the average athlete that does "CrossFit" outside of an affiliate is not doing many movements correctly; not to say that there aren't guys out there that do the majority of lifts in a perfectly safe manner, but take the average soldier with no specific training and give him an oly. platform, a wod, and an entire squad or platoon to beat in a wod and you have a recipe for improper technique, rhabdomyolysis, or other injury. What needs to be done is to convince "big Army" that CrossFit is safe and the injuries being seen from "CrossFit" are actually attributable to incorrect technique and unsupervised lifting, as put forward by Maj. Dan Blackmon in his article "Warning Signs" which is in the CF Journal. If CrossFit is ever going to be truly adopted by the US military a long-term study needs to be conducted on the safety of PROPER CrossFit and there needs to be some way to send as many leaders or conductors of physical training to certifications so that proper technique can be taught to all soldiers so we see a lot less "CrossFit" related injuries. A few more thoughts on this. I think an interesting study would be to take some athlete with experience in Olympic Lifting, train them using CrossFit, and see how their performances improves compared to another group of athletes doing some other form of strength and conditioning program. Since the college football season just kicked off I think it would be interesting to see what would happen if you took a football program's strength and conditioning regimen, and substituted CF. You could use things like deadlift or back-squat improvement because, at least I'd assume, the athletes are already familiar with these movements. Things that could also be used to measure performance increases include 40yd dash time, 225 bench test (even though we're not big on bench press in the CF community), and vertical jump. Feasible? not really, but it would be interesting, provide large enough samples, and a control group if executed at different programs, some sticking to their program, others using CF. I’ve been doing Crossfit with my squad for about 5 months now, and it has yielded very positive results. My squad was sub-par when it came to physical fitness. I had failures in the APFT, the lowest APFT average in my platoon, and Soldiers notoriously on profile. After about 5 months of doing Crossfit I have no PT failures the highest average in my platoon, and injuries are nonexistent. I can also say that camaraderie is very high within our squad. One problem I see when unit say they do Crossfit; is that the programing is all wrong or very week. People, when not coached or trained properly concentrate on doing what they are best at. I repeatedly see many units doing the same WODs week in and week out. I'm lucky to have trained at a box and received my level one certification when I was recruiting in Salt Lake City before returning to the regular Army. The skills that I learned in fitness, dieting, and recovery turned out to be priceless. While I do think that Crossfit will help soldiers physically, I also think that pulling 14 staff officers to test it out is flawed. The APFT is a joke and that should have been attacked first followed by FM 21-20. Changes to the Army's PT program should come from the NCOs (the ones responsible for leading and training soldiers). Im sure the study is appreciated, but watch the Army screw this study up and try to implement this on a huge level. They Army cannot tolerate anything that is not routine. And since Im complaining- doing a WOD with a reflective belt on and shirt tucked in is dumb. Crossfit could help soldiers physically, but the soldier has to endeavor to do it. I'm in total agreement with LTC Hodges in the last paragraph about changing MWR (Globo Gym) culture. The DOD, it seems, has a cozy relationship with the commercial fitness industry. Top Brass & MWR would serve soldiers and their families better with more functional fitness centers. I would hope to see MWR facilities phase out the machines for an obviously superior alternative. I'd be stoked to see MWR staff obtain CF Level 1 and other certifications so that they would be on hand to address proper technique and safety concerns. If you look at GRF (Government Recreation & Fitness) publications, you'll see plenty of emphasis on functional fitness. I'm waiting to see a feature on CrossFit. Great report. I hope to see more analysis of this type with line unit soldiers where a CF Box exists. "Top Brass & MWR would serve soldiers and their families better with more functional fitness centers." Totally agree. There need to be more facilities like the Audie Murphy Fitness Center on Ft. Benning. These sound like the sort of comments one sees in drafts of peer-reviewed studies. I would love to see the report after the authors have rewritten it to address all these concerns. This limited study certainly provides a foundation for conducting a larger study that addresses sample size and random assignment of individuals to either control or exercise groups. As for the comment that Fran does not relate to Army skills, at least it is measurable. It might not be possible with available data to tease out survival rates or mission success rates as a function of Crossfit training. I have two nephews and 2 nieces in the theater in three branches of our military and when I talked to them about CF I was told that they were already doing CF. When I got more detail I found that they did indeed do "some" elements of CF, but hey, a Kettle Bell is a Kettle Bell, an Olympic bar is a bar and a push up is a push-up right? What is difference is the variety and intensity and most important (IMHO) is the genuine interest by Trainers and fellow atletes in that everyone (at their level) of fitness is treated the same as long as they "want" to improve, are willing to do the work. It will take time like anything else to make changes in the military, but it will come! It is exciting to me (at 57) to see so many young men and women genuinely interested in changing their lifestyle to include a major change to their diet and physical conditioning!--march on! At the end of the day its all about getting the Officer In Charge to make a calculated risk and try and sell the idea to his boss. Not going to happen. Change and the word military do not go over so well. To many venders and contractors with a long line of lawyers will fight this to the end. Why do we have a machine you can sit on and pretend your clinbing a rope? Gee whats the price of that piece of gear cost. When I asked why not actualy put up a rope to climb you can guess the response, to dangerous. Leg extention and leg press machines the list goes on and on. The base gyms are outfitted with non cost effective gear. At this point in time its up to the individual to train outside the standard PRT requirements. If your in a LEADERSHIP role enlisted or officer take that opportunity and run with it. Yeah some will resist but the ones who get it, will help spread the word. Crossfit is an excellent alternative to standard military fitness. The biggest obstacle remains "winning" over non-believers, and secondly, providing the correct equipment across our Bases, Forts, Camps, FOBS, and so on. Unfortunately, Xfit can also gain a negative reputation by people who misuse the name, and consider everything CROSSFIT. The biggest complaint I have heard is the lack of running combined with lack of improvement in push-ups specifically. This is bogus. The running issue is one of people getting lazy and not following strict workouts that include runs or sprints (I have been guilty of this myself). The push-ups can easily be maintained and improved by routinely doing a crossfit inspired warm-up (We normally adhere to 15 pull-ups, 15 push-ups, 15 sit-ups, and 15 air-squats) at a minimum of 1-3 rounds before each workout. On days that are heavy with pull-ups, simply skip the warm up pull-ups and so on. The bottom line is that crossfit is by far the best program to promote and encourage total body conditioning and preparation for the situations any military member should be prepared for. Combat is fast faced and intense - why shouldn't our workouts be? I submitted a request for attention to the lack of a Fort Bliss, TX CrossFit affiliate on post on an online forum and was shocked at the response from the so called Fort Bliss Fitness page monitor: We do not conduct CrossFit here at Ft. Bliss. Shocking when you think that Zumba/etc are offered in the fitness centers on post. Also shocking when you see how many fat-bodies and overweight Soldiers there are here at Fort Bliss. Will forward this article on to all that will read in order to educate. Wonderful! So simple. I was searching for a service to merge PDF files and found a great service. I mostly use AltoMerge to merge PDF files. You can easily merge your documents here altomerge.com also here http://www.pdffiller.com/.